Ahhhhh – I love this thread! 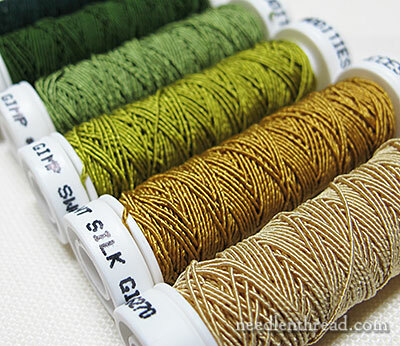 Silk Gimp is unlike any other thread on the market. Really. I mean that! It’s absolutely unique. 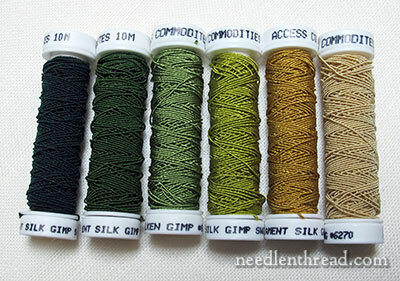 It’s not like other threads called gimp (here’s a comparison of different threads called silk gimp); it’s not like DMC memory thread (some folks have substituted memory thread for it, but there’s no real similarity between the two threads, so the embroidered outcome is completely different); it’s not like normal silk embroidery thread. It’s a bit difficult to explain exactly what it’s like, and if you’ve stitched with it, you know what I mean! If you haven’t stitched with it, I’ll describe it as a tiny, shiny, wormy-like thread, soft and supple, with incredible sheen, very manipulative, producing an absolutely unique result in the finished embroidery. Here’s the green assortment for silk gimp by Access Commodities. I love it! It’s a lovely line up of shades that are very woodsy – perfect for autumn and equally perfect for spring, depending on how they’re used and what other colors they are combined with. Loads of possibilities! Silk gimp, made entirely from Au Ver a Soie silk from core to outside wrap, is a tiny cord-like thread (it’s very fine! ), and you can read all about it in this article about silk gimp that I wrote last year. 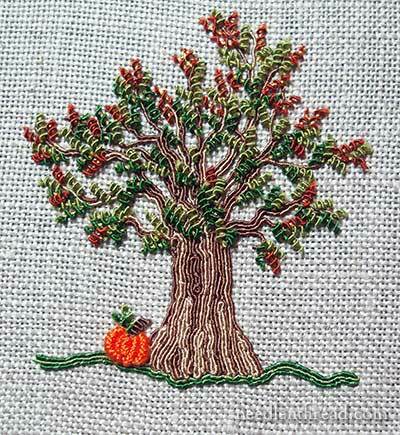 You can see various stitches demonstrated with silk gimp, and the beginning of my silk gimp autumn tree, which was great fun to work! 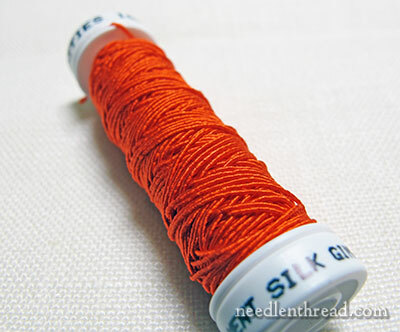 Another recent color of silk gimp on the market is this magnificent orange. I’m not sure what to call it, except flaming orange – it’s a deep, bright orange, perfect for fall stitching (I’m thinking little pumpkins, like these embroidered pumpkins, only worked with silk gimp instead of bullion knots). Fun color! So, what can you do with silk gimp? 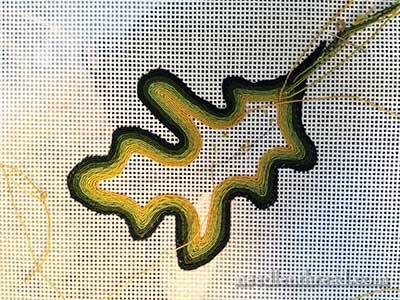 First, you might wish to check out the article (mentioned above) that explores different types of surface stitches created with silk gimp. But gimp is primarily couched, and when it’s presented in shade packs, lots of possibilities open up with couching. 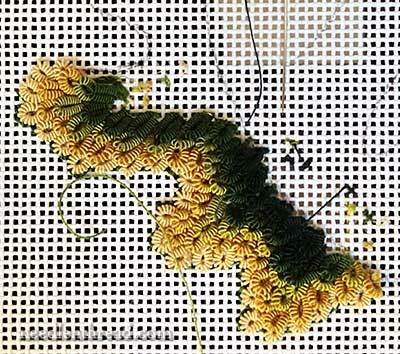 The next three samples were stitched by Lamora Haidar, on needlepoint canvas. On this first photo, you can see the effect of changing shades pretty clearly, from the darkest greens on the outside, to the light browny-yellow-greens on the inside. Oh, the possibilities for this technique! Incorporated into goldwork and metal thread embroidery? Here, Lamora laid down equally spaced rows of thick string, and is couching the gimp over them. The photo above doesn’t feature silk gimp. 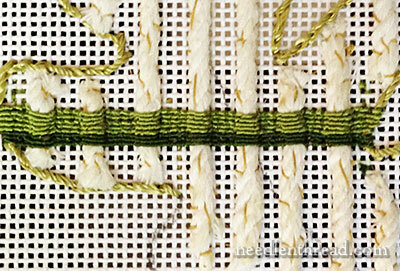 Instead, it shows the same color assortment in silk wrapped purl. I love it! Perfect for the leaves on my autumn tree, which I plan to re-do into “something” one of these days. This is the tree. I’m dying to re-work it now – or at least, a version of it. In the meantime, I’m excited about this color assortment and the possibilities – you can pretty much bet I’ll be playing with them soon. And I’ll be giving you an opportunity to do the same – I’ve got a couple sets to give away down the road. So keep an eye out! Now, I’m off to play! Enjoy your weekend! I do like your tree especially with the added pumpkin really pretty. It’s interesting what Lamora has done with the Gimp thread and the silk wrapped purl so many possibilities with this thread. I must order some Gimp I’ve just been on Hedgehog’s website but they don’t seem to have the bright orange or the browns used on your embroidered trees only green colours which is a shame. Thanks for sharing this with us. Thank you so much for this post, Mary! I always appreciate your photography, too. I am looking forward to working with this thread! Oh Mary! Why do you do this to me? How am a supposed to write a clinical trial database now that I am desiring silk gimp? I have never seen it or used it but your description has me agitating to find some. I do a lot of goldwork and I think it would fit so well with my ecclesiastical designs. But I have just about zero funds. Having said this, I am heading to the Knitting and Stitching Show at Alexandra Palace, London UK next month. And if silk gimp should be available, it will be bad news for my credit card balance! what a beautiful threads, I like texture and I like to make trees, and your tree is amazing, and those silk wrapped purl look incredible. Lovely colours – definitely look like fall. My mother used to knit with a product she called gimp and made things like belts with it. I think what she used must have been much thicker than what you have. She would have been working with it back in the 50’s (possibly the late 40’s). Wow! What fun ideas. I love the couched silk gimp over the cords in the second photo. Can’t wait to see more ideas for using this thread. Next Next post: Silk Gimp – Give-Away!